California has a happy excess of Japanese restaurants, all of them putting their own unique spins on a diverse and delicious cuisine. Izaka-Ya, located on San Jose’s First Street and sharing a building with a steakhouse and a dim sum restaurant, crafts excellent sushi combinations alongside Japanese street food favorites that are difficult to find in the States. The menu is large, and it can be slightly intimidating to a newcomer; fortunately, the small portion sizes allow a diner to make a substantial meal out of a few dishes. For appetizers, consider ordering an onigiri, a rice ball with various fillings. My personal favorite is the ume onigiri ($5.75), filled with tart plum jam. It may be hard to find on the lengthy seafood menu, but don’t overlook the takoyaki ($4.75), crisp octopus dumplings covered in flavorful sauce. As for the entrée, there are a variety of combination bento boxes available, many of them coming with a selection of fresh sushi rolls. For sashimi enthusiasts, the tuna sashimi bento box ($14.75) provides tuna that is perfectly chewy and bursting with flavor. 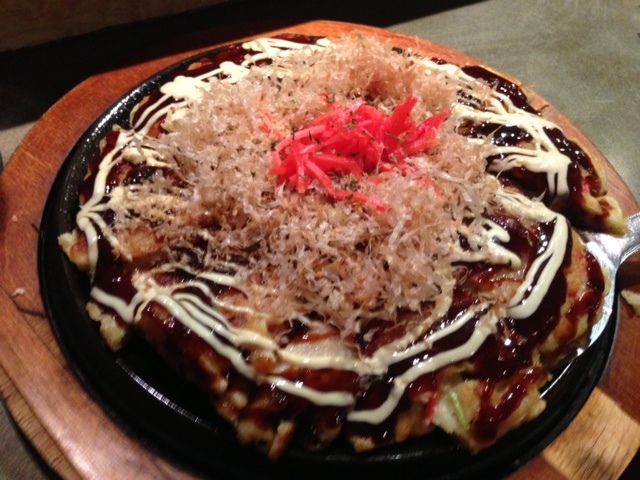 However, the best entrées at Izaka-ya are the okonomiyaki ($10.75-$13.75). This is a savory pancake made with cabbage and covered with sauce, often described as "Japanese pizza." Izaka-Ya's are creamy, flavorful, and incredibly filling, and a variety of add-ons are available, including pork belly, octopus, and okra. There are only a handful of Bay Area restaurants that serve okonomiyaki, so make sure to try it on at least one occasion. If you find yourself with room for dessert, the best choice is the rich banana tempura ($3.75), though those seeking lighter fare my be interested in ice cream or even a fresh orange to close out their experience. Izaka-ya also has a decent selection of beer, schochu, and plum wine, as could be expected from a restaurant modeled on urban Japanese drinking establishments.